Currently the emission of infrasound at work places and in daily life is becoming more pro- nounced because of an increasing number of sources as wind parks, pumps of renewable en- ergy systems or the permanently increasing road traffic. The evaluation of also increasing complaints is accompanied with a still limited understanding about the perception mecha- nisms at these frequencies hindering the development of efficient assessment methods or the definition of exposure limits. New insight into mechanisms of perception can be expected from neuroimaging techniques providing objective information about noise processing in the brain. In the framework of a project funded by the European Union within the European Metrology Research Programme (EMRP) the brain response following the stimulation with sounds at infrasound frequencies was investigated. Using functional magnetic resonance imaging (fMRI) a significant response was detected which was localised within the auditory cortex and which was present down to the lowest frequency presented (8 Hz). First evidence indi- cates that the signal strength of the blood-oxygen-level dependent (BOLD) signal shows a minimum at 20 Hz and a further investigation of BOLD-signal in dependence on the loud- ness was carried out. Since fMRI offers high spatial but low temporal resolution magnetoencephalography was employed as an alternative method. Significant brain responses could be detected down to a frequency of 20 Hz. By the aid of a theoretical model the dipoles were localised also within the auditory cortex. At lower frequencies sources could be identified but no clear assignment to physiological regions was possible. Within the test subject ensemble one person, however, showed a significant response also at 8 Hz. Hearing is one of our most crucial senses and has great impact on well-being in daily life and conditions at workplaces. The assessment of sound in the audible frequency range between 16 Hz and 16 kHz is highly developed and a rationale and wide experience are available to ensure an effi- cient protection of hearing or management of sound exposure in the public or at workplaces. In con- trast this knowledge is missing at the ‘wings’ extending the hearing frequency range to infrasound and ultrasound frequencies. Infrasound is pervasive and is generated from an increasing number of sources, often also emit- ted by renewable energy sources as wind parks and heat pumps. Although commonly declared as ‘non-audible’ the number of complaints about infrasound exposure has been increasing exponentially in Germany  and also in other countries serious problems exist . It has been agreed that infrasound is perceived by humans and it represents an almost unknown hazard to human health. Unfortunately the perception mechanisms are not widely understood since only a limited number of reliable investigations and data exists. The health impact of infrasound is also controversially discussed and this complicated situation results in a lack of a rationale basis for the definition of exposure limits, assessment methods and safety regulations. Fundamental idea of this work is to use objective diagnostic methods for the investigation of perception mechanisms and perception thresholds of infrasound. In a first step hearing thresholds and equal loudness contours were determined to describe how loud infrasound is perceived by a group of test persons. The same test persons took part in a second experiment of investigation of brain responses by magnetoencephalography and functional magnetic resonance imaging. These imaging methods are able to determine responses to stimuli revealing which part of the brain how strongly responds to infrasound tones. Because of the careful audiological characterisation of the test persons individual loudness values could be set and the brain responses were related to subjec- tive loudness ratings instead of simple sound pressure levels. Hearing threshold data are the basis of any assessment of sound impact and because hearing thresholds are specific to many technical and behavioral conditions the number of data for infra- sound is not appropriate to analyze the large variety of application situations. In addition they were necessary for a definition of stimulus levels in the brain imaging experiments and for the interpreta- tion of results carried out within this study. Thresholds were determined for all test persons incorpo- rated in the measurements. Their age was between 18 and 25 years in accordance with requirements of international standard . A 2-alternative-unforced-choice method was chosen which includes a possibility for the test persons to give no answer appropriate to the complicated task of perceiving infrasound. The results are summarized in Fig. 1. They are in excellent agreement with data from the litera- ture . The newly determined data connect the conventional hearing frequency range with infra- sound frequencies. The dependence of thresholds on frequency varies with decreasing frequency. Between 40 Hz and about 15 Hz the steepness increases and at lower frequencies the curve becomes more flat again. Feedback from the test persons revealed that the perception changed around 20 Hz from a tonal one to a pronounced mechanical sensation. One of the most important elements of a description of hearing sensation is the determination of how loud the sound is perceived by a person. Equal loudness contours are a key element of investi- gation of annoyance and they were determined with 30 test persons who also were engaged in the hearing threshold experiments. The known technique  of categorical loudness scaling was ex- tended to infrasound frequencies and the test persons had the opportunity to choose between eleven categories when test signals were presented. Referencing to a loudness scaling at 1 kHz allowed the description of the results in phon. Figure 1. Determined hearing threshold from 125 Hz down to 2.5 Hz, the bold gray lines show the free field threshold (broken line) and the estimated threshold for infrasound frequencies from the literature  (solid gray line). Figure 2. 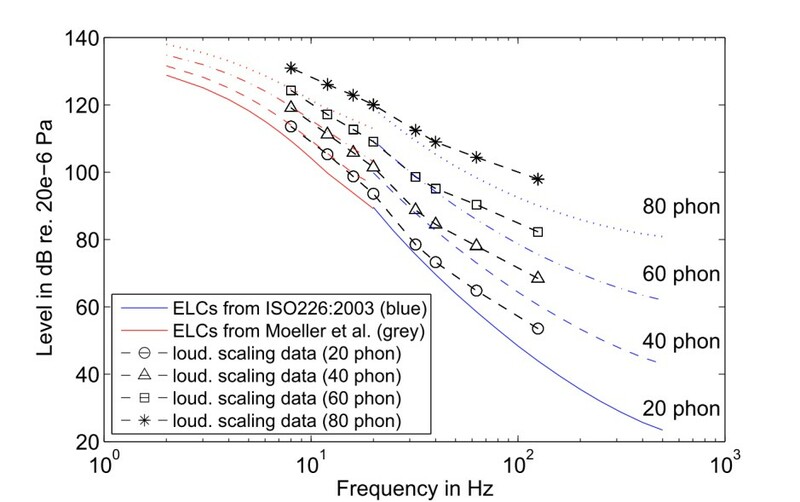 Equal loudness contours from 125 Hz down to 8 Hz (broken black lines with symbols), blue lines show the free field ISO226 loudness contours, and red lines show estimated equal loudness contours for infrasound frequencies from literature . The resulting equal loudness contours are depicted in Fig. 2. They link the existing normative loudness contour data to values in the lower audible and infrasound frequency range (125 Hz to 8 Hz). Most striking feature of the data is the obviously decreasing sound pressure level difference between the contour lines. This is equivalent to a decreasing dynamic range of hearing in this frequency range accompanied by the effect that even sound signals with sound pressure levels only slightly above the threshold will be registered as annoying. Furthermore, with regard to complaints about infrasound noise of wind farms the fact is discussed whether also signals with a sound pres- sure level below the threshold could be annoying. To obtain a better understanding of the perception mechanism behind, the brain responses of infrasound were be investigated by contemporary brain imaging techniques as magnetoencephalography (MEG) and functional magnetic resonance imaging (fMRI). MEG determines brain activity via the measurement of induced magnetic fields outside the head. Superconducting quantum interference devices (SQUID) are able to detect the magnetic fields with extremely low field strength as generated by ion flow during neuron activity. Using a commercial 128 channel helmet system (Yokogawa) the brain responses induced by infrasound stimuli of single frequency tone bursts were measured. They were generated by a sound source with extremely low distortion constructed in house to avoid any harmonic distortion leaking into the hearing frequency range. Because of the low frequencies requiring longer tone bursts the number of averages was lim- ited to 80 in order to keep the session length at about 32 minutes. The sound pressure values of the sound source were set individually for each test person corresponding to the loudness values deter- mined in the hearing tests. Brain activity could be found during hearing stimulation down to 12 Hz (see Fig. 3). The measured magnetic field structures changed with decreasing frequencies and strongly depended on the individual person. 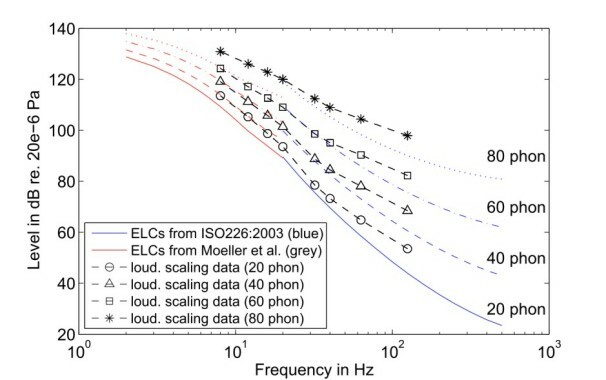 The most test persons lost the dipole-kind field structure with decreasing loudness at 125 Hz and 12 Hz but for some it occurred again at lowest frequencies even at threshold (see Fig. 3 upper row). Magnetic dipoles were reconstructed by an inverse model algorithm and they were localised in the brain region of auditory cortex. Unfortunately the localization uncertainty is quite large and includes also other brain regions in addition to the auditory cortex. Figure 3. Measured magnetic fields above the head for two test persons (one row corresponds to one test person) at 12 Hz and 125 Hz as a function of individual loudness. To improve the spatial resolution of results additional measurements using functional magnetic resonance imaging (fMRI) were carried out using the same test persons as in MEG and the audiological experiments. In contrast to MEG the fMRI determines the uptake of blood oxygen in brain regions with enhanced neuronal activity (Blood Oxygen Level Dependent = BOLD signal) making fMRI to an indirect measure for neuronal activity. 16 test persons listened to pure tones between 8 and 250 Hz and images using a 3 T-device were taken with a sparse sampling technique in order to avoid brain activation in response to the scanner noise itself. Brain activity was found down to 8 Hz exclusively in the auditory cortex, see Fig. 4. No other brain region was activated within the set significance level of p = 0.001 and the cluster size N > 22. As expected the activity, described by the strength of the BOLD-signal (beta values), decreased with decreasing frequency starting in the audible range at 250 Hz. Reaching a minimum activity at about 20 Hz the signal seemed to increase again at very low frequencies. These data and further measurements suggest that around 20 Hz the perception mechanisms may change. Several hypotheses are possible and one idea is that the hearing sensation is accompanied by a somatosensory contribution when being exposed to infrasound stimuli. Figure 4. Slices of the brain with color-coded frequency dependent activation areas, p < 0,001, cluster size > 22. Figure 5. BOLD signal representing activation as a function of stimulus frequency. In this study objective audiological methods and the determination of brain responses to nonaudible sound stimuli using brain imaging were combined to contribute to the investigation of perception mechanisms of infrasound. Hearing thresholds and equal loudness contours down to 8 Hz were determined in a test persons group. The data were applied to deduce average data for a general determination of threshold and loudness but also for a definition of individual sound pressure levels which are perceived as defined loudness by the respective test person. Brain responses to infrasound tones at these well defined loudness levels were investigated in the same test persons using MEG and fMRI. Responses in the auditory cortex down to 8 Hz, respectively 12 Hz could be verified. Several details in the brain imaging results suggest that at frequencies around about 20 Hz the perception mechanism might change or is realized by a combination of different processes. One hypothesis is that possibly a somatosensory excitation of the auditory cortex contributes at these frequencies. The results offer the opportunity for an improvement of an objective assessment of perception at infrasound frequencies which is a prerequisite for a reliable evaluation of emission sites in the public and at working places. Financial support from the European metrology research programme (EMRP) is gratefully acknowledged. The EMRP is jointly funded by the EMRP participating countries within EURAMET and the European Union. Krahé, D. Schreckenberg, D., Ebner, F.,Eulitz, C., Möhler U. Machbarkeitsstudie zur Wirkung von Infraschall, Umweltbundesamt, Dessau, 2014 [Online] available: http://www.umweltbundesamt.de/publikationen/machbarkeitsstudie-zu-wirkungen-von- infraschall. Timmerman, N. S. Wind turbine noise, Acoustics today, 9, 22 – 29, (2013). ISO 389-9 Acoustics – Reference zero for the calibration of audiometric equipment – Part 9: Preferred test conditions for the determination of reference hearing threshold lev- els, Geneva, (2007). 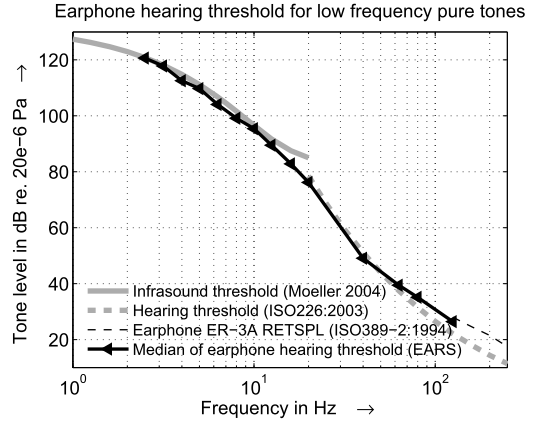 Moeller, H., Pedersen, C. S. Hearing at Low and Infrasonic Frequencies, Noise & Health, (23), 37-57, (2004). ISO 16832 Acoustics – Loudness scaling by means of categories, Geneva (2006).